This delicious appetizer (which more often than not turns into full-on dinner) has been a staple at our New Year’s Eve Olympics celebration for a few years. It fits all the requirements of our NYE menu: cheesy, tasty, and easy to make. Mix ingredients together in a bowl. 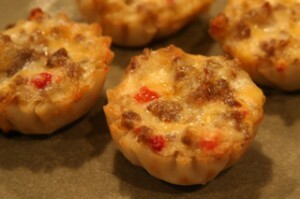 Fill wonton cups/mini fillo shells and place on a baking sheet or stone. Bake 10 minutes at 350 degrees.